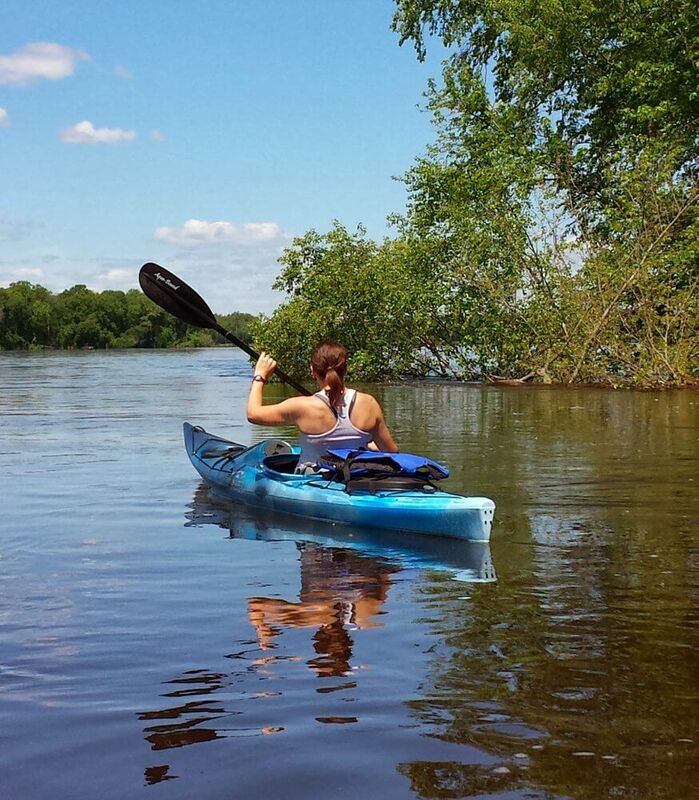 The Wisconsin River is consistently rated as one of the best kayaking rivers in the Midwest. The last 92.3 miles have been protected from further development by the creation of the Lower Wisconsin State Riverway which now encompasses nearly 80,000 acres of land on both sides of the river. The Lower Wisconsin begins at Prairie Du Sac at the last dam on the river. 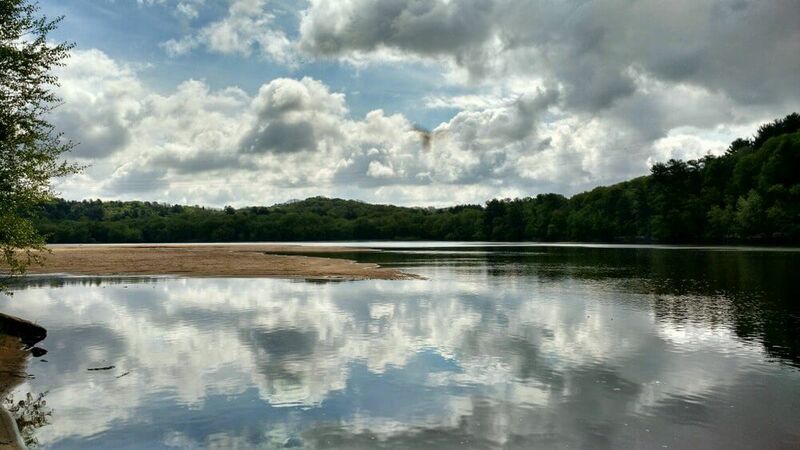 From Prairie Du Sac, it flows freely through the unglaciated hills of southwest Wisconsin where it joins the Mississippi river at Prairie Du Chien and Wyalusing State Park. Because the sandbars of the river are constantly shifting and the average depth is only 5 feet with lots of variation, motorboats have trouble navigating the river which makes for a very kayak friendly experience. In some places, you’re actually more likely to see hovercrafts than boats, however local fishermen do make their way onto the river. (Hint: If you ever ask one of the locals for information, make sure to get at least a second opinion – for whatever reason, they find it hilarious to send people in the wrong direction). The river itself is wide open, sometimes nearly a half mile across. 95% of the river bottom is sand and which results in tons of sandbars between Mazomanie and Spring Green that are great campsites. The river can get pretty busy on the warmest weekends of summer so your best bet is to go during the week for solitude and the best chance of having your own sandbar. At peak periods and times of high water, it’s not uncommon to have to share a large sand bar with another group – though there is typically plenty of space to spread out. At worst, you’ll usually see a group a few hundred yards ahead of you and a few hundred yards behind. Whereas canoe camping roughly equates to car camping, Kayakers need to be in a backpacking mindset. Storage space is extremely limited and you’ll need to make good packing choices. Small dry bags, soft sided coolers, and flexible materials will be your best friend. You’re going to need to fill every nook and weirdly shaped cranny so the smaller and more flexible your gear, the better. Water bags/bladders are a great way to carry extra water and backpacking stoves take up very little room. Some groups that aren’t necessarily light packers choose to rent a canoe in addition to the kayaks. That way the canoe can take most of the big, bulky items (i.e. cooler, water jugs, chairs, etc.) in addition to the limited space in the kayaks. The one exception I make for packing small is that if you have a choice between a nice $300 backpacking tent or a $50 Walmart tent, go with the Walmart tent. Take it from a guy that’s gone through 5 tents in as many years, sand will destroy your zippers. If you don’t lubricate your zippers it won’t take long (a week or two of regular sandbar use) to grind them down to the point that they’ll pull apart and be unusable. If you’re in the peak of a bad mosquito season, I guarantee that’s the last thing you want to deal with. You’ll want to bring your own drinking/cooking water in with you (large storage bags that will only see use a few times a year are pretty inexpensive) since the river water picks up a significant amount of sand and tannins on it’s journey through the state. These will significantly shorten the life of a water filter and a few extra pounds of water in your boat isn’t going to be noticed. Plan to use about 1.5 gallons/person/day to be on the safe side. Basic camping food works just as well out here as it does in the backcountry. Again, small size is key and weight is unimportant. The main thing you need to be aware of is the prep/cooking area while you’re on the river. You’re on sand. A lot of sand. It will get in everything if you’re not careful and your food will be terrible. Always try to cook up off the ground if possible (difficult on a kayak trip) but if nothing else, bring an old blanket or ground tarp to keep sand as far away as possible. Also cook upwind of the camp and only let the cooks in the kitchen. The easiest way for sand to make it’s way into your food is being kicked up by people’s feet as they walk by. It doesn’t take much to ruin a good meal. Trust me. The DNR does not require camping permits or fees of any kind. The only requirement is that you arrive and leave by water. Sandbars are first come, first serve. (I recommend starting early and finishing early in order to have the best chance at getting a great sandbar) In the middle of summer, mosquitoes along the river bank and in stands of trees can be intense depending on how much rain we’ve had. To keep the bugs at bay, your best bet is to aim for a spot in the middle of the river and away from trees and grasses. The light breezes in the evening and the distance from shore usually helps keep the annoyance to a minimum (you’ll typically notice mosquitoes at sunset and sunrise). The ideal sandbar has a small stand of trees and grass at one end of the island that serves as a privacy area for bathroom breaks or a windbreak. Sorry, bathrooms are not provided on the sandbars (though portable toilets are located at most landings). If you’re a regular backpacker, you know you’re always told to do your business at least 200 yards from any water source. That isn’t the case here, mostly because it’s not possible. Proper bathroom etiquette is to dig a 6-8 inch hole in the sand, do your thing, and cover it up. Ideally, toilet paper should be packed out but in practice, that rarely happens. If you’re not going to pack out the toilet paper, please make sure to completely bury it in the 8″ hole – there’s nothing worse than dodging ‘landmines’ on your way to making one of your own. If you walk near the obvious bathroom spots towards the end of the summer, you’ll see what I mean. Don’t be ‘that guy’ (or girl). The water level can fluctuate depending on the amount of rain in the area. If dry weather or very light rain is expected, the river is not likely to move more than an inch or two a day. If heavy rains have been in the area, the river can rise as much as a foot or more overnight. In order to minimize any risks, set up your campsite in a place at least 16 inches above the waterline and pull your kayaks way up onto shore (you can place a stick in the sand at the waters edge to keep track of changes in water level). If rising water is a serious concern, you can also tie your kayak to your tent which will keep it from floating away without you. We’re usually able to accurately predict high water levels a couple days out. If there’s a chance for big rises in the water level, we’ll give you a heads up. The Wisconsin River does not have a lot of rules, but the few we do have are taken seriously. Bring garbage bags to pack out all of your trash. When I say pack out your trash, this includes the landings. This is a Leave No Trace river and there are no garbage facilities (trash can be brought to our shop 3 miles up the road). Absolutely no glass is allowed on the water (this includes pickle jars, beer bottles, etc). This is strictly enforced by the DNR and results in fines of up to $739. Wardens will often ask to check your coolers. No one wants to deal with broken glass and a sliced foot in the middle of the river. Fireworks are not allowed on the river. Don’t bring them. Don’t be obnoxious. If someone is camping nearby, be respectful with the noise, attitude, etc. Campfires are allowed on the river. The only thing to be aware of here is that any firewood brought into the riverway has to have been harvested within 25 miles of where it is burned. This is a state law and it’s not unheard of for state troopers to issue tickets when crossing the Illinois/Wisconsin border with firewood. In times of drought, a fire ban may be issued but this is extremely rare. Alcohol is allowed on the river (kegs included). I only mention it because it coincides with ‘Don’t be obnoxious’. You may want to keep the hangover to paddling distance ratio in mind when deciding to booze it up. Any other questions are likely answered on our FAQ page.